OK, so it’s been a bit too long since we posted anything. At the time of last writing, Lisa was in Canada and Dan had been left behind to keep blogging. And now, she’s back in North America for a few weeks and Dan will be blogging again. Hmmm, seems like the failure to keep it updated when she is in Australia must then be hers! And so this blog will be in first person again, with me/I being Dan. So, what has happened in the 10 weeks since last post? Let’s see, we’ve learned a bit about heat. 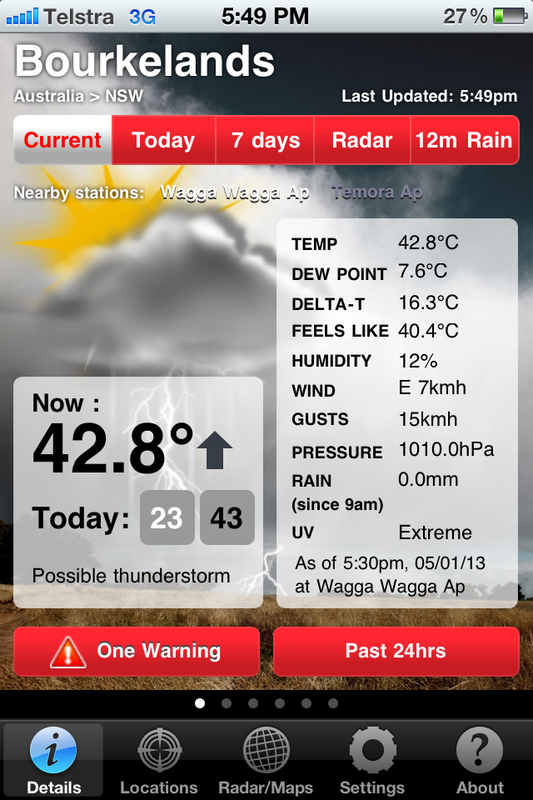 On Saturday, 5 January, 2013, we lived through the hottest day we’ve ever encountered when the temperature in Wagga hit 43.5 C. It was, barely, bearable. Thankfully we have refrigerated air con – we spent most of the day indoors. But wait, there’s more: Friday, 18 January was even hotter, topping out at 44.1. Not that it was noticeable – at that point, a half a degree makes little difference! But the opposite effect is that when it starts to cool off in the evening it becomes very noticeable, with Lisa running for a jumper when it got down around 25! We also, in mid-December, learned that blinds are very expensive in Wagga. We bought some new ones, better ones to replace the useless verticals that were here when we moved in, for the east facing windows. The purpose was originally to cut the morning light so we could sleep in, but now we’ve also realized how much heat they keep out. Those are the only windows that get a lot of direct sun, but we’ll do the rest of the house eventually. Without them, the air con would probably have been working even harder to keep us cool. Covering five windows cost us more than to do the entire house in Edmonton…but that’s Australia. 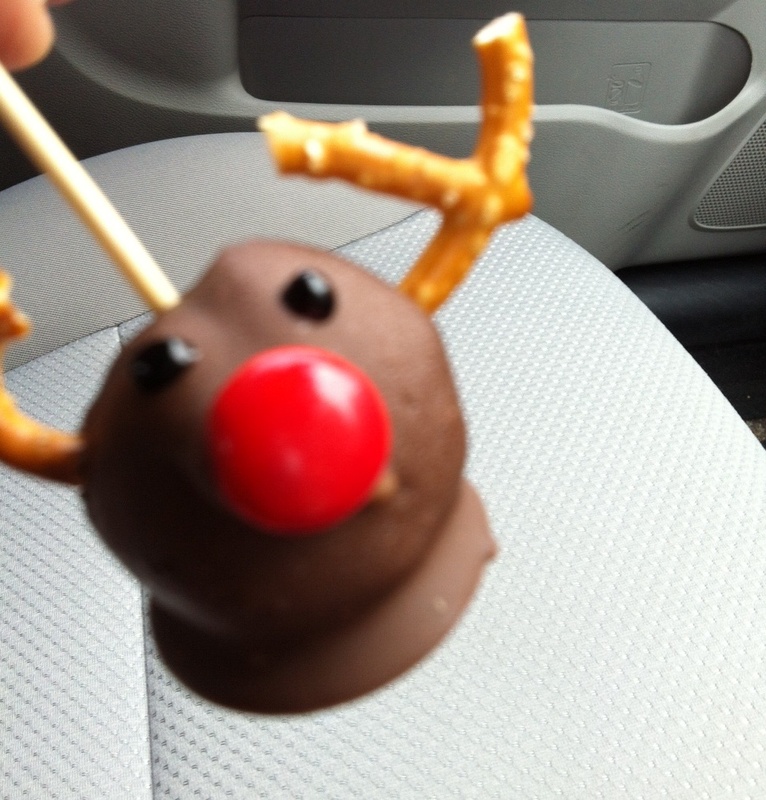 There is absolutely no point to this picture of a reindeer cakepop that my dentist gave me after a pre-christmas visit. It just happened to be one of the more interesting photos on my phone (that I couldn’t foresee needing later). And how cool does it make the house on those hot days? Well, when it was 43 outside, we could get it down to a comfortable 23 or so indoors. Remember, as we wrote about in the winter, this heating system doesn’t really have a proper control, so we just turn it on and let it run. We’ve learned to use the timer to shut it off at night, otherwise we wake up in a 17 degree house. Had a couple of visitors during the early January heatwave too. Nephew George and his partner Sarah are living in Australia on work tourism visas, traveling around working as much as they can (up to that time, picking fruit). Unfortunately most of the continent shuts down late December/early January so they had a bit of spare time to hang with us before moving on. Which seems odd because fruit and veggies are thriving at that time of year. OK, so they might not look perfect but there’s nothing tastier than tomatoes that actually ripen on the vine! Which leads me to a follow-up of a previous post about our garden. Still hate it…grass is pretty brown despite regular watering. 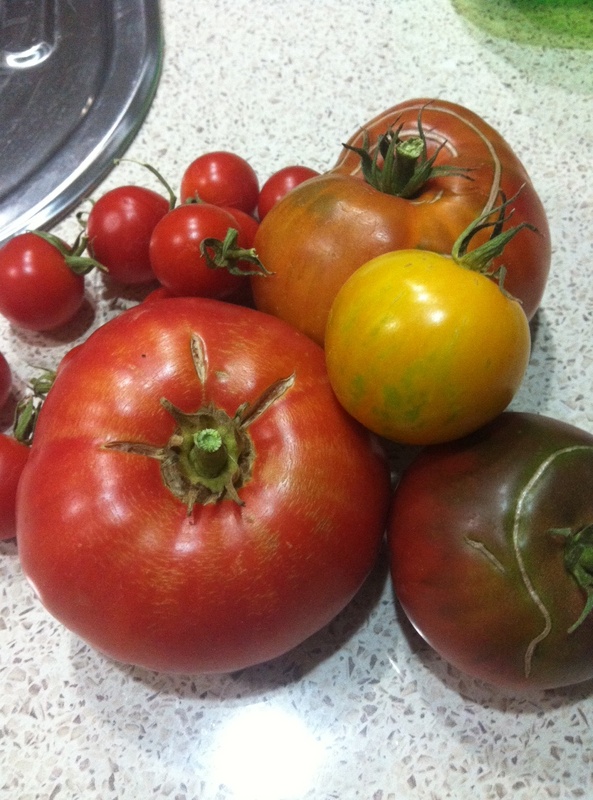 But our tomatoes (I say tom-ay-toh, Aussies say to-maa-toe…) have done incredibly well. Initially we planted 8 plants, 2 got frosted and replaced…the result: 6 tomato trees that bore amazing fruit, one that didn’t do much of anything and one that produced fruit that rotted as fast as it ripened. Problem is, we didn’t keep track of which variety any were, so next year will be just as experimental as this season was. And when I say ‘amazing fruit’, well, we’ve eaten home-grown tomatoes every meal for the past 6 weeks, and still have a couple weeks left. Last night I trimmed back some deadwood and got rid of the useless plants to make it easier to water. We’ve had luck with both cherry and full-sized tomatoes, some yellow, some almost black (intentionally). They pretty much took over the little beds we have. And people often comment that we were lucky not to have fruit flies…just luck I guess. Nestled among the tomatoes were some salad greens that don’t do well at these temps, an apple cucumber vine (tasty, but a bit tough-skinned…still producing) and a sunshine squash plant that did really well. And we’ve got lemons and limes bigger than golf balls! COOL!!!!!!!!! Following up on the last entry, I also have to say my prediction about Courtney Barnett doing well is spot on – she has become the most common search term sending people to our blog, overtaking ‘Bobs Birds and Pets.’ So hey, to direct more traffic to the blog, I’ll tell you about more music: just bought a compilation called Nuggets: Antipodean Interpretations of the First Psychedelic Era. Long story short, it is bunch of Aussie bands covering tunes from the original Nuggets compilation and while all of it is good, some of it is spectacular! I’ve only heard 3 of the 18 bands before (even own a disc by one of them, Pond…) so it is great to be exposed to some new artists. And by new, I mean that for many of them it is their first recording. But I’m now looking forward to hearing more from, in particular, Pearls, Step-Panther, and Baptism of Uzi (who contributed an amazingly quirky krautrock meets blues instrumental of Baby Please Don’t Go). And not that anyone cares I did manage to track down the Gareth Liddiard album I mentioned in last post. Ummm, hard to describe…glad I’ve heard it, but it is more political/socially conscious than the Drones albums…but it is in no way easy listening…interesting and good, but in a way that makes you just a bit (lot?) uncomfortable…. This entry was posted in fruit, gardening, weather. Bookmark the permalink.